Shimla: The main opposition Bharatiya Janata Party (BJP) expelled former Union minister Jaswant Singh, one of its senior-most leaders, on Wednesday for praising Pakistan’s founder Muhammad Ali Jinnah and said it wouldn’t compromise on matters of ideology or discipline. Singh’s expulsion was announced on the opening day of a three-day chintan baithak, or brainstorming session, that the party began in Shimla to take stock of its defeat in the April-May general election, which saw the BJP’s Lok Sabha seat tally decline to 116 from 138. “I had issued a statement yesterday (on Tuesday) that the party fully dissociates itself from the contents of the book. Today, I put up the matter before the parliamentary board which decided to end his primary membership," BJP president Rajnath Singh said. Some analysts said the expulsion of Singh, 71, may be part of a road map prepared by the BJP’s ideological parent, the Rashtriya Swayamsevak Sangh (RSS), to revive the party after its back-to-back general election defeats. Interestingly, it was former party president L.K. Advani who sealed Jaswant Singh’s fate at the BJP parliamentary board meeting on Wednesday morning by proposing the expulsion of his senior colleague after hearing demands for action against the former minister, party leaders said. In 2005, Advani, former deputy prime minister, was forced to step down as head of the party after criticism from the RSS and within the BJP for describing Jinnah as a “secular" leader during a trip to Pakistan. According to BJP spokesperson Prakash Javadekar, the party leadership was also angered by references in Jaswant Singh’s book to Sardar Vallabhbhai Patel, the first home minister of India, who is credited with unifying the country, that went against the BJP’s official stand. “This book had mentioned Sardar Patel to be responsible for the country’s division. It is against the core ideology of the party and hence the action was taken," said Javadekar. “Today’s decision meant only one thing: that the party would not compromise with our ideology, and discipline was above all in the party," Javadekar said. 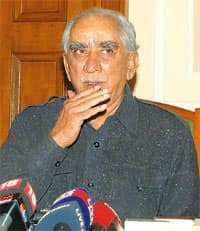 Jaswant Singh, a former Union minister of defence, external affairs and finance, joins other former BJP leaders Madan Lal Khurana and Uma Bharti, ex-chief ministers of Delhi and Madhya Pradesh, respectively, who were expelled from the party on disciplinary grounds. The decision came a day after RSS chief Mohan Bhagwat said in a television interview that it was time for senior leaders in the BJP to give way to the younger generation and act swiftly to contain infighting in party ranks. Analysts said the expulsion was a symbolic assertion of a role for the RSS in shaping the BJP’s future course. Unlike other senior party leaders, including Advani, Jaswant Singh has never been an RSS member. While the BJP is trying to chart a road ahead, “the RSS is saying in its own way that we decide the ideology and there is none above it", said Jyotirmaya Sharma, a political science professor at Hyderabad University. Jaswant Singh’s book had been used as a pretext for his expulsion, Sharma said. A tearful Jaswant Singh said he was “pained" by the manner he was treated. He said the party was turning him into a Ravan, the demon in the epic Ramayana, an echo of his charge that Jinnah had been “demonised" and he was hurt that the decision to expel him was conveyed to him on the phone. “I should have been informed personally, not on the phone. I am a member of BJP since the day the party was formed," Jaswant Singh said. “Advani and Rajnath should have informed me personally. If I was to be sacked... then the party should have informed me in Delhi itself. It’s a matter of regret that I have been sacked for writing a book." Jaswant Singh, along with party colleague Arun Shourie and Yashwant Sinha, had been critical of the party leadership after the 2009 Lok Sabha poll defeat. Shourie and Sinha were not invited for the Shimla meeting. The former minister said he would not resign his Lok Sabha seat and would remain in politics. “I have no feeling of self-pity...I live on respect," Jaswant Singh said. “If that is lost once, it cannot be regained." PTI contributed to this story.